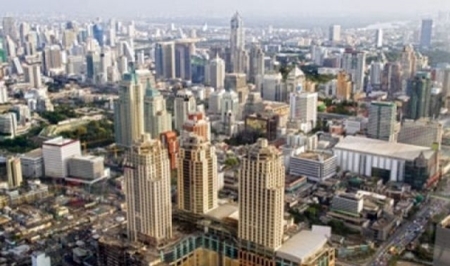 Thailand’s economic growth will possibly be capped at 4 per cent this year given delays in the state’s 2014 budget spending and the planned Bt2 trillion investment on infrastructure development, a leading banker said today. Teeranan Srihong, Kasikornbank president, said there were no positive signs contributing to internal economic resurrection in the last four months of the year. He forecast Thailand’s economic expansion by 4.5 per cent next year after the global economy gains strength and the government kicks off some investment projects. “Wars in some countries have toned down, boosting foreign consumers’ confidence. Thailand’s export sector should improve next year if the Thai currency remains weak as it is,” he said. Mr Teeranan said Thailand’s overall efficiency has neither improved nor worsened – ranked 27th among 60 countries – as surveyed by the Switzerland-based International Institute for Management Development (IMD). Compared to countries in Southeast Asia, Thailand is third after Singapore and Malaysia due to its lack of infrastructure development. The government has mapped out investment plans for various projects but they have never been implemented, diminishing Thailand’s competitiveness in the region and creating concerns that the country’s ranking may drop, he pointed out. The private sector’s proposals on state investment in research and development of products, and human resources development have never been executed by the government, he said. Expressing concerns on household debt, Mr Teeranan said Kasikornbank has closely monitored the financial situation and found that non-performing loans remain controllable while borrowing expansion was on target at 9-11 per cent.